I saw this sugar cane in the market on the weekend and thought it looked yummy! I had my first sugar “drinking” experience in the village last fall—at least that was what they called it. Some of you may be familiar with the process. 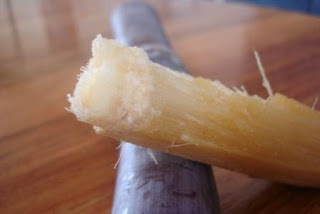 You cut a stalk of sugar cane, and cut/peel the hard skin off with a sharp knife. Then you use your teeth to chew/yank off a hunk of the bark/pulp/string stuff in the middle. You chew on it, “drinking” the sugar juice and when there’s just pulp left (i.e. it’s not chewy/juicy anymore) you spit it out. I have a bit of trouble doing this in public, as mom drilled into me that “what goes into your mouth does not come back out!” But I enjoyed it in the privacy of my kitchen this weekend, with no one to watch me - hee!